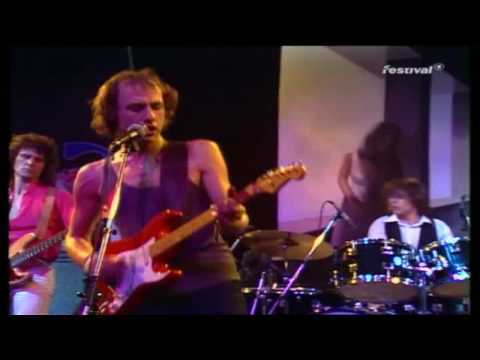 "Sultans of Swing" was the first single release of the British rock band Dire Straits. Although it was first released in 1978, it was its 1979 re-release that caused it to become a hit in both the UK and USA. The song was first recorded as a demo at Pathway Studios, North London, in July 1977, and quickly acquired a following after it was put on rotation at Radio London. Its popularity soon reached record executives and Dire Straits were offered a contract with Phonogram Records. The song was then re-recorded in early 1978 at Basing Street Studios for the band's debut album Dire Straits. The record company wanted a less-polished rock sound for the radio, so an alternative version was recorded at Pathway Studios in April 1978 and released as the single in some countries including the United Kingdom and Germany. The song was written by Mark Knopfler on a rainy day in a bar in Ipswich. The inspiration came from a mediocre jazz band playing in the corner of a practically deserted pub. At the end of their performance, the lead singer came up to the microphone and announced that they were the "Sultans of Swing".